This elegant home offers plenty of space for you and your guests, over 4,300 sf. Professionally decorated the interiors boast fine finishes and appointments throughout the home. The Great Room is excellent for entertaining and enjoying the stone fireplace. If you like to cook this kitchen is certain to please with its 6-burner gas stove, lots of counter space, ice maker, microwave, etc. The dining table seats 10! 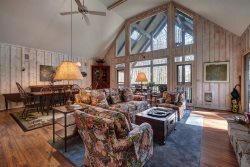 Enjoy the crisp mountain air and idyllic surroundings with family and friends on the fabulous living porch with fireplace. Privacy abounds, the master suite with private sitting room is located on the second level. There are two additional bedrooms on the second level and the third level has two more bedrooms and a separate sitting area. All guest bedrooms have en-suite baths. Stunning mountain views of Chimney Top and Rock Mountains will make your stay memorable in this spacious three level home.